Orange is the New Black 6x03 Recap: "Look Out for Number One" (There’s a Place Called Kokomo) [Contributor: Chelsea Cruz"
"Look Out for Number One"
In a flashback, a young Frieda is serving her time in Litchfield Max working as a seemingly loyal bodyguard for Carol. Carol is the hot tempered C-Block kingpin who feuds with Barbara, her real-life sister, of D-Block. The girls have a rough day when they find their stash completely raided, which makes Carol furious, as she blames Barbara and D-Block. Carol confronts Barbara about stealing her stash at the most violent kickball game we’ve ever seen, resulting in Carol figuring out she was double-crossed by Frieda. Meanwhile, Frieda turns over all the drugs to the Warden, guarantees her transfer out of Max, and hopes she stays out of trouble. Linda Ferguson is finally being released; unfortunately, it wasn’t quick enough to escape getting her head shaved for lice. We do get to see Carmen and Boo mock Ferguson and Skinhead Helen being lice-free because... well, she’s a skinhead. Red races to get in touch with Frieda, calling her cowardly for her suicide attempt. Frieda explains that there are more people in Max who want her dead. As Red tries to reason with her, she advises Frieda to think of a more creative solution. As the women keep up their exercise, Frieda is able to swipe a bottle of bleach from a janitorial cart. Although Red calls her crazy for it, Frieda’s mind is already working quickly on the “creative solution.” We witness our good 'ol friend Frieda’s transition into a sweet and gullible inmate who’s much too old to remember the events of the riot. In her interrogation, Red realizes why the F.B.I can — and might — convict her of second-degree murder for CO Piscatella. During a failed attempt of cell block charades, Red tries to explain to Nicky and Piper that Piscatella was murdered. Nicky finds out through word of mouth, but unfortunately Piper thinks that Alex was the one who was murdered instead. 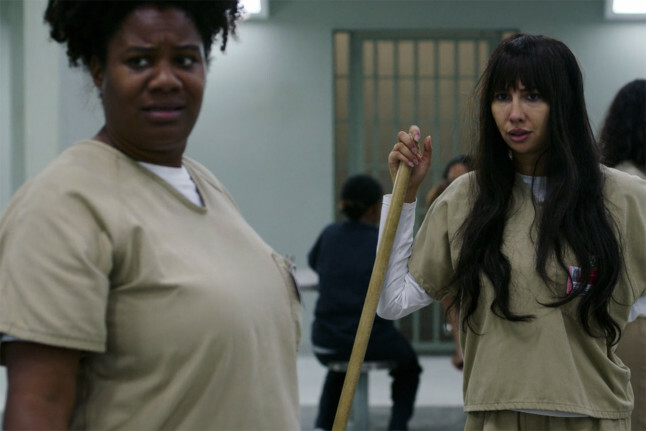 Daddy is distributing janitorial jobs to the new D-Block inmates but Cindy, Flaca, Lorna, and Daya struggle to keep a hold on their toiletries as a part of D-Block initiation. These scenes are the more humorous parts to the episode, but we are getting to know the difference between Blocks C and D and the kingpins who run the blocks. The girls successfully steal a bag of toiletries but disgustingly find out that the products have been replaced with urine. We see Daddy giving Daya gifts and special treatment through the episode. These two definitely have their own storyline this season and it’s going to be interesting to see their dynamic develop. Nicky, Frieda, and Piper go through their questioning — Nicky with Les and Michelle, Piper with her lawyer, and Frieda by her elderly self. A grieving Piper doesn’t really care about the questioning; she’s lost her need to defend her prison family. Meanwhile, Nicky is being talked into giving up Red to the F.B.I, with Michelle convincing her that this is one way to a better life. Wanting to stay safe from Blocks C or D, Frieda may have given up more than one person — but we aren’t entirely sure yet. As the episode comes to a conclusion, newly-appointed VP Ferguson is scheduling to meet with Litchfield’s new warden, Figueroa. Frieda is escorted to her new block... but not before she is spotted by Carol, who isn’t too happy to see her. We travel with Frieda as "Kokomo" by the Beach Boys starts playing. Frieda is whisked away to the beautiful B Block, which is nicknamed "Florida." In Florida, she is greeted by Suzanne and the two happily share pudding cups and cheers their new life. More and more we are witnessing the ladies abandon their loyalty to one another. Each episode is slowly splitting everyone up. Every new relationship built treads very lightly, and we are left to consider who we can trust. Following Frieda, we’re just praying that this crafty, elderly, and crazy woman will be fine. Like she said, there are more people in Max with more reason to want her dead and she needs to be looking out for herself. How do you feel about the new relationships building in the season? Are you excited to see an older Carol and Barbara duke it out? Which of the girls do you miss the most? Keep working through that binge-watch!